When you are getting your landscape designed, you know that you want it to look good and that it has to be functional and last for a very long time. The outdoor spaces of your property are exposed to the elements and that means any material/s that are used here should be largely weather-resistant. With this in view, pavers become an ideal choice for various outdoor settings. 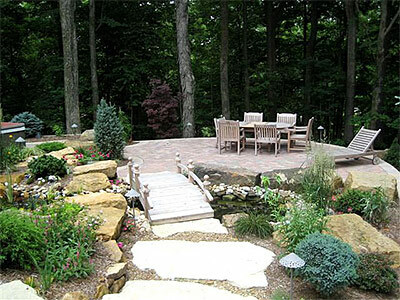 We at Mother Nature Landscaping are a full service company that has handled a number of small and large scale landscape design projects for customers in and around Bloomington, Martinsville, Mooresville, Bedford and Columbus. Over the years we have also catered to customers across Franklin, Seymour, Greencastle, Greenwood, Plainfield as well as Beech Grove. We design and install various outdoor features as part of these projects for our clients and most homeowners like to get a patio installation for their home. For most of our projects, we use different types of patio pavers and you can choose from ones made of natural stone, brick or concrete. These interlocking units are available in a variety of shapes, sizes and colors and we can create stunning patterns with and these, to create a unique look on your property. Walkways are an essential installation in most landscapes. Installing these in your garden or yard, allows you to reach the different spaces without walking over the lawn and flower bed spaces. In many instances, they may also lead off from the driveway, deck or patio, into the other outdoor spaces. When we are choosing walkway flooring materials, we take care to ensure that these complement the appearance of the rest of the landscape. Walkway pavers could be made of brick, concrete or natural stone and these could be smooth cut or rough cut. There are a number of different natural stone paving to choose from such as travertine, slate, bluestone, flagstone etc. We have been operating in this space for 15 years and can provide custom patio plans and walkway installation, based on your specific needs. You can discuss your project details with the specialists at Mother Nature Landscaping and we will provide solutions at very reasonable landscape design cost. The number to call is - 812-339-5296. You can also contact us via this online form or request for a free consultation and quote via this form.